Cardinal Capacelatro says of St. Philip Neri, “There was one feature in his character that never fails to fascinate the young: he was always mirthful and humorous. Like all the Florentines of his time, he was noted for a vein of pleasantry.” “I eat little,” he said once, “because I don’t want to grow fat like our friend Francesco Scarlatti.” He was a vegetarian and if, when walking with his friends, a butcher’s cart passed, he would say, “Thank God, I don’t need any of that stuff.” St. Thomas Aquinas has somewhere a good word in favor of practical joking, and as we shall see, St. Philip was greatly attracted to the practice. As has been remarked of St. Francis of Assisi, “The sense of humor salts all his escapades.” After lodging for a time at the house of Cardinal Leo, he was beaten by devils, and he declared that this was his punishment for consorting with cardinals. Legend relates that when he sought an interview with the Sultan of Egypt with the object of converting him, a trap was laid for him. The Sultan ordered a carpet covered with crosses to be spread on the floor of the tent. “If he walks on it, I shall accuse him of insulting his God; if he does not, I shall accuse him of insulting me.” Francis, of course, walked on the carpet, and on being charged with his impiety, he answered, “You must know our Lord died between two thieves who also hung on crosses. We Christians have the true Cross; but the crosses of the thieves we leave to you, and these I am not ashamed to tread on.” True or not, this story proves that St. Francis was commonly credited with a very nimble wit. Bl. Dominic Barberi, the Passionist who received Newman into the Church and who was in all things a most mortified man, permitted a very liberal indulgence to his sense of humor. His bi­ography records many of his witty sayings. When a certain pious lady consulted him about her nocturnal visions, he proceeded to cross-examine her about the kind and the quantity of wine she was in the habit of drinking at supper. This article is from Fr. Roche’s A Bedside Book of Saints. And this wit and humor of the saints is very instructive. It reminds us of what we are apt to forget, of what we sometimes do not even suspect: that there is more real joy in a saint’s life than there is in all the intoxication of worldliness. All that comes from God is joyous, and holiness comes straight from Him and is, in fact, the only attribute of His that man can imitate. Piety in the saints is blended with all that is lighthearted and exhilarating. Fulbert of Chartres described the monastic spirit as a blend of “natural simplicity and angelic hilarity”; that is to say, the saints have some of the liveliness of the angels. The saints, at any rate, are always good advertisements for religion. They uphold and exhibit the “bright side” of devotion and preach the lesson of the joyful service of God. Where there is a great deal of faith, there will be always a great deal of laughter. England was “Merrie England” when she was full of faith; and Chesterton maintains that the English people have not laughed heartily since the Middle Ages. Humor has been called “the fountain of reconciliation and well-being which, smiling and indulgent, contemplates the world with a kindly eye.” It was the union in them of this natural gift with the supernatural gift of faith that produced the optimism of the saints. Editor’s note: this article is from a chapter in Fr. 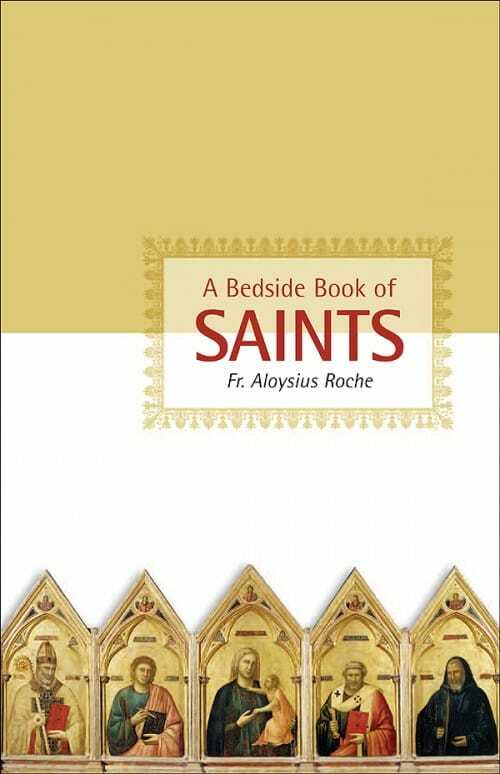 Roche’s A Bedside Book of Saints, which is available from Sophia Institute Press.